Romeo is raising PTSD awareness across the state with his “Walk With Frank,” a 750-mile walk that started March 1 in Western New York. Romeo, 70, hopes to reach Suffolk County’s Bay Shore by June 1 to complete his journey, which is the subject of a documentary directed by Emmy Award-winning filmmaker Richard Chisolm. 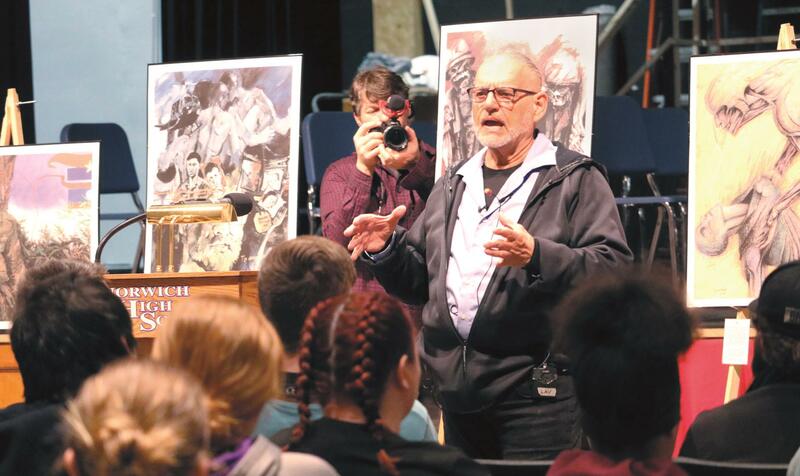 Romeo took a brief detour Tuesday to share his story as one of the longest-living survivors diagnosed with 100-percent PTSD-related disabilities with Norwich High School seniors and juniors. Romeo said he was surrounded by the enemy, shot multiple times and left for dead during wartime, then struggled with a drug addiction that led to a less than honorable discharge from the military. His PTSD struggles and nightmares continue to this day, but Romeo is doing something about it by helping others through “Walk With Frank.” His pit stops at homeless shelters, schools and other venues include a traveling art exhibit called “The Art of War,” featuring several works created by Romeo and fellow Vietnam veterans suffering from PTSD. Romeo answered questions from several curious NHS students during his hour-long presentation Tuesday, then enjoyed lunch at the high school with his walking mates and school staff members. He said “Walk With Frank” will hit Oneonta and the National Baseball Hall of Fame in Cooperstown by the end of this week. For more information on “Walk With Frank,” visit http://www.walkwithfrank.org/ online.